With Mother’s Day just around the corner it’s time we all started thinking about what we could get our mum’s to make them feel special. It sounds cliche but good quality smellies never go a miss in our household, after all, what mum doesn’t like a lovely long soak in a nice relaxing bath? 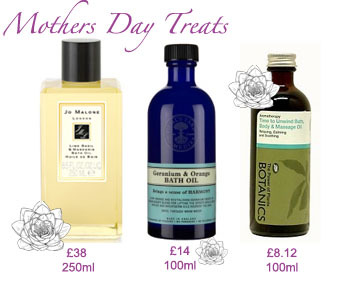 If the purse strings are tight then try out Boot’s Botanics Time To Unwind Bath, Body and Massage Oil (£8.12). Scented with orange, juniper and frankincense, this deep herbal scent will help a stressed out mum to recover from a long day on her feet. If you are feeling a little more flush then plump for Neal’s Yard Remedies Geranium & Orange Bath Oil (£14) to bring about a sense of harmony. Orange and geranium will uplift spirits whilst apricot and wheatgerm oils nourish the skin. If you are feeling positively lavish then why not pick up one of Jo Malone’s luxury bath oils? Known for their heavenly scented products there are plenty to choose from, but we love Lime Basil & Mandarin (£38 250ml). This aromatic warm scent with a hint of citrus and herbs make for pampering perfection.